la carte wisdom from the international bestseller Bringing up Bebe In BRINGING UP BB, journalist and mother Pamela Druckerman investigated a society of good sleepers, gourmet eaters, and mostly calm parents. She set out to learn how the French achieve all this, while telling the story of her own young family in Paris. BB DAY BY DAY distills the lessons of BRINGING UP BB into an easy-to-read guide… for parents and caregivers. How do you teach your child patience? How do you get him to like broccoli? How do you encourage your baby to sleep through the night? How can you have a child and still have a life? Alongside these time-tested lessons of French parenting are favorite recipes straight from the menus of the Parisian creche and winsome drawings by acclaimed French illustrator Margaux Motin. 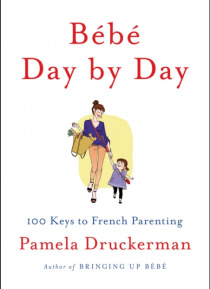 Witty, pithy and brimming with common sense, BB DAY BY DAY offers a mix of practical tips and guiding principles, to help parents find their own way.